The following is page two of my attempt to wrestle the Easter Monster. 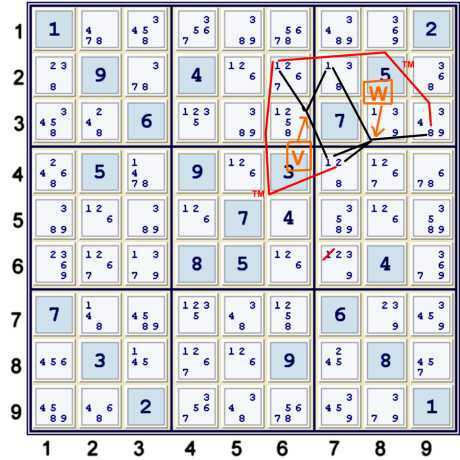 In order to efficiently tackle this puzzle, it seemed wise to derive a few more groups. However, most of the groups derived will differ from this group. Most of the groups will be groups of strong inferences. The difference being that although the groups will have at least one truth, they may have more than one. The reason for maintaining a list of strong inferences rather than a list of weak inferences is simple: As the puzzle progresses, the meaning of a derived weak inference could become less important. However, all strong inferences, proven or native, are valid for all time. Suppose that a derived strong inference set has three members. If one is eventually proven false, the group is still valid. However, it has now been reduced to two members. If one of the remaining two members is proven false, the group is resolved. This is not the case, of course, with weak inferences. Although this does not immediately forbid anything, it will be of some use. Next, I should like to apologize for the bastardization of their ideas for my own personal take on how to employ them. It has been argued that one cannot make a deduction like the one above without making assumptions. This is a false conclusion. The Triangular Matrix below demonstrates that one need not consider multiple truth states to reach the deduction above. Start at (2)Box7.2 locations. Think matrix row 1, 2 columns, thus +1. - we need to get to an nxn matrix, thus we need only count excess columns. Note weak link to one of three 2's in row 5. One 2 aligns, two do not. We are adding 1 matrix row, but two columns. Thus +1. Total: +2. Note weak link from one 2 in row 5 to one 2 in row 8. Note one 2 in row 8 is the same as one in Box7. There are 3 2's. Two can align. Think +0. Total +2. Force the matrix to zero by taking the two unlinked items and shoving them into column 1. Think -2. Total 0. The process has the look and feel of an algorithm. Note that this simple chain uses the derived set Z. Without that efficiency, the chain would be much more complex, and involve using 11 native strong inferences instead of only 3. Total 0. (note we now have one of three possible pigeonhole matrices, but none of these three is a symmetric pigeonhole matrix, as column 1 is not mutually exclusive. Note by symmetry the set of three possible PM's. Note the set of three strong inference sets generated. Record. (1)r4. four locations. one can be grouped. think 3. r4c5 is either weakly linked to row 2, or it is part of target column. r4c78 could be a target column entry, or be partially weakly linked to r2. +1 or +0. Need to get this baby down. Choose +0. Target column defined. Total count still +2. (1)r8. Each item weakly linked to one of the other matrix rows. -1. Total +1. 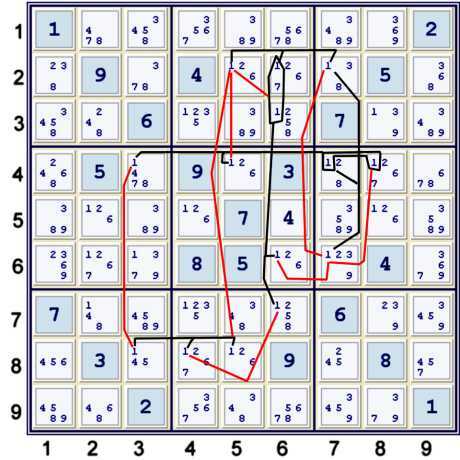 In puzzle row 2, if we align r2c6 to have no entries below it, we would still be at +1. If we force it into column 1, we get another -1, thus total 0. This could be one result. Result seems to have too many entries to be of much use. Consider (1)c7. Group it into two pieces, one of which is weakly linked to each item in current result column except one. Make this new matrix row the top row. Take all items but r2c6 out of result column and place under r6c7. Total matrix change +0. Record new smaller strong inference set. The manipulations could require some practice. But, if it was easy, this would not be a difficult puzzle! Note one could reverse the temporary decision above and still get somewhere. In fact, one could eventually arrive at the same place, albeit a longer path. The nature of single candidate chains is that there is almost always a different path to the same result. In fact, my original path was equivalent to the reverse of the temporary decision above. I actually started with (1)Box2. After getting to zero, I removed the extraneous data. There are many ways to do this. Normally, one would like to start a deductive path at a bivalue or bilocation set. This allows more flexibility, and incurs only a +1 penalty. 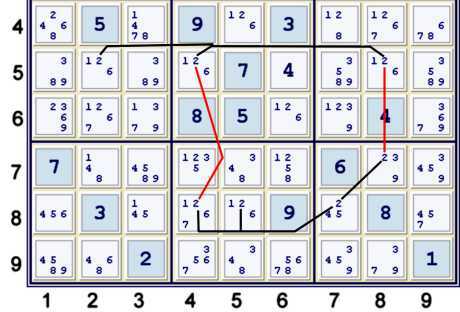 However, This puzzle has few such places to start. Thus, the for complex vehicles such as these. Each of the derived sets now acts like half a cell. It has the strong inference. Most of them, except for Z, do not have the weak inference active in the unit. Thus, a semi-cell equivalent. However, the matrices and AIC do not rely upon exactly one is true in a set. They rely only upon at least one is true interplayed perpendicularly (considering 4 dimensions- cell, box, column, row) with at most one is true. Note further that the deduced sets we now have listed have some overlap. Perhaps it is time to try for an actual elimination! The graphic above does not dispay all the information used. I am unequal to the task of graphing the deduction without distorting the deduction. Therefor, the Triangular Matrix below will serve as both the proof and illustration of the elimination. Note that the first column describes the strong inference set used in the row. The bottom row indicates any non-native weak inferences used. The proven strong inference set:(1)r24c7 => r6c7≠1. Since this puzzle would not crack using most normal methods, I started to build a list of small, somewhat complex, and very ugly deductions. Once I found a few that seemed to trip over each other, I was able to put something together. Once again, however, the base idea is just to count left-over unlinked components of strong inference sets. Once one can reduce the matrix size to nxn, something has been proven. With intermediate deductions, one can always force the matrix size to be nxn. However, one may lose homogeneity in the deduced strong inference set. This is not a theoretical problem, but it certainly is inconvenient. After making this elimination, much of the work for the next one has been done. However, I still would like to prove some more deduced strong inference sets. Since this page is long enough already, this page is done! To understand all above, wow... I have to spend a lot of time. Why you do that with me... :D.